For more than a century, the Blue Mountains of Oregon have echoed with the sounds of hard-working trains laboring up and down steep grades and squealing through numerous curves. Even with today's powerful, high-tech locomotives, railroaders still face a daunting challenge of running long and heavy trains through a range of mountains with three different summits. 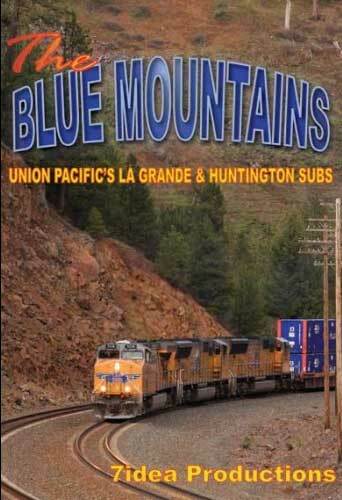 This DVD takes you on a 204 mile journey through "The Blues" starting at the Hinkle hump yard and heading toward the Idaho border just east of Huntington. Heavy trains and heavy grades means BIG POWER! Thrill to the sound of 16,000 ton soda ash trains tackling 2% grades with mid and rear DPUs! Watch long stack trains race by at nearly 70 miles per hour! Enjoy winter scenes around Meacham and Kamela where trains seem to appear right out of the ground as they crest the summit and immediately plunge down the other side. The magnificent scenery of northeast Oregon's Blue Mountains coupled with a good mix of long, high-tonnage trains makes this an amazing program to see and hear! Shot in January and April, 2010.
mysp7377 (San Diego Ca.) on 2012-08-21 17:25:58. This is a DVD that you hope won't stop. The action and photography is awesome narration is informative and interesting. Starting out at and around Heinkle the track profile is relativity flat with all trains running by at full main line speeds but shortly its down to a crawl as these trains fight there way up the Blues. Lots of intermodial,manifest and unit trains with mid train and DPU helpers. Motive power:lots of Gevos,AC4400s,SD70Ms,SD70Ace's and more. 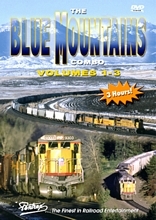 A must have for fans of big time UP main line action. Four Stars. Hueycrewman (Dulacca, Qldm Australia) on 2011-06-02 15:20:18. With this seller, and this video production company, what can go wrong !!!! If you don't buy this Bluray/DVD from this seller, you will lose a life enhancing experience. Another superb disc from a super seller. 7idea Productions have made this a trip to remember. Tom J (Kentucky) on 2011-01-08 15:32:54. Excellent videography, which seems to be typical for 7idea videos, and some good RR action. Best scenes are in the last 30 minutes. Overall, the scenery was a little disappointing. Cool shot at 1:12:05 of a train cresting Kamela Summit. It appears to come up out of the ground. At 53:24 and again at 08:52 we see UP 1983, an SD70ACe loco with WP badging that was launched in July 2005. It was in 1983 that the UP bought the WP. Oxman Curve at 29:09 is pretty cool. It's a horseshoe curve. Al (Las Vegas, Nevada) on 2012-10-24 14:35:54. I traveled this area between 1956 and 2000. The DVD made me recall memories of my many trip through the area. Skg (Chicago) on 2011-04-01 15:35:52. 7Ideas has the best in train locations. They do a great job with subject matter, video camera angle, and picture quality. This video was it all and more. At first I thought there was a little too much narration, but as the video progressed, it turned out to be just right. Quality of video is EXCELLENT! !